This flower brings all types of butterflies to a garden when they are in bloom with beautiful flowers! This plant fools you because it's simply roots when it comes but doesn't take long to turn into a bright flower. Purple Cone-flower - Echinacea purpurea. The Purple Cone-flower is a herbaceous perennial that is native to the central and south eastern areas of the United States. This plant grows commonly in meadows, wooded areas, and prairies. It tends to bloom toward the end of the summer and will thrive for three to five years in a favorable environment. The Purple Cone-flower has a pinkish, purple petals that surrounding a large cone in the middle. The stems are 2-5 feet and it is very likely to attract butterflies as well as hummingbirds. 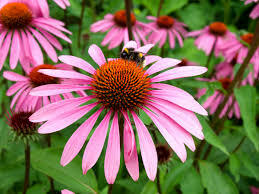 The Purple Cone flower prefers a great deal sunshine and thrives best when in well drained soil in a somewhat moist environment. It is an easily grown garden plant and is commonly used to make an extremely popular herbal tea. 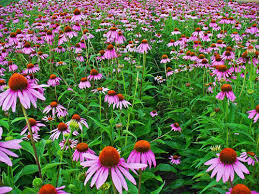 Purple Cone-flower is a herb that can help a lot with bronchitis, flu, colds and even some infections. This plant was often used by the Native Americans to battle problems associated with the common cold. This plant is becoming more popular among physicians because of the effect it has one these ailments. There are a lot of benefits from this plant when used as a herb supplement. Are you looking for a strong summer perennial flower which is sun and drought tolerant? The Purple Coneflower does all that and more! These beautiful flowers are also known to attract hummingbirds and butterflies. If you're looking to lure nectar-loving critters to your garden, there's no better way than to include a scattering of Purple Coneflowers. Purple Coneflowers are native to North America, with natural ranges with spread broadly from the east coast to the Midwest. Their stems are straight and sturdy, making them a great garden plant you can grow to later be transferred to a vase in the home. Purple Coneflowers are striking flowers which feature bright purple and lavender petals forming thickly around a reddish-orange center. These flowers add a lot of bright and beautiful color as they are blooming and also bring lots of butterflies and hummingbirds to a garden location. These are great to add a lot of life to an area and also brings beautiful curb appeal to all homes as they are in bloom. These flowers are very easy to care for and grow and does not take any special care. Purple Cone-flower supply lots of fantastic color during the spring and summer months.